I just wrapped up my last order. There are no other mandatory projects on the horizon and everything coming out of my kitchen from now on will be entirely done for fun. Not that orders aren't fun, I just think that I can experiment more and try cool stuff when it's just for me (or rather just for my friends and coworkers who end up eating my creations). The funny thing is that even though I haven't "had" to do anything this week, so far it's been so crazy busy that I'm reaching for a morning cup of coffee with much more urgency then usual. But back to the order. There were three kinds of cupcakes and a small smush cake for the birthday boy (who was turning 1). And while the chocolate cupcakes with peanut butter frosting were good, as were the pear spice cupcakes with cream cheese frosting, today I'm going to tell you about the uber moist, super flavorful, chocolate banana cakes with banana frosting. Cake recipe from Joy of Baking and the frosting is my own concoction. Preheat oven to 350 degrees F and place rack in the center of the oven. Line 24 regular-sized muffin cups with paper liners. I found these awesome monkey cups at Woodman's. They are made out of nonstick foil magic stuff and look just as lovely in the box as they do when filled with yummy cupcakes. In another large bowl, whisk together the eggs, mashed bananas, water, milk, oil, and vanilla extract. Add the wet ingredients to the dry ingredients and stir, or whisk, until combined. Pour or scoop the batter into the muffin cups, about 3/4 full, and bake for about 20 minutes or until a toothpick inserted in the center of a cupcake comes out clean. Check the cupcakes at about 17 minutes. I don't know if it's my oven, but mine were done a bit earlier. They bake up beautifully with a nice dome on top that doesn't collapse as they cool. Remove from oven and let cool on a wire rack. In a clean bowl, whip the cream cheese and butter until light and fluffy, about 5 minutes. Add the banana mush and whip to incorporate. Add the pudding and the whipping cream and whip on high for another 3 minutes or so. Taste the frosting. I thought the pudding mix and the bananas provided enough sugar, but if you like your frosting sweeter, add some powdered sugar. If you want it a LOT sweeter, also add some more heavy cream to maintain the right consistency. I'm not sure what's cuter, the cupcakes or that lion cake!! I love it! You did a great job. I love love the lion one. Wait until julie sees it...she is going to want one. Lovely all 'round. 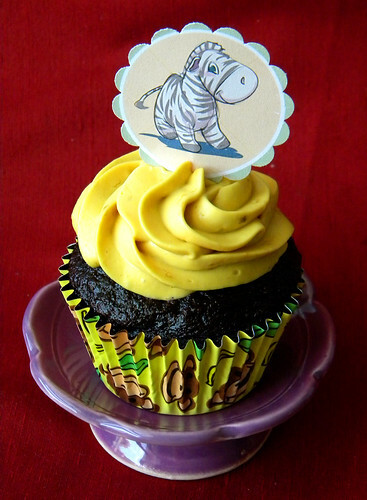 Love the cupcakes, the color contrast, and the lion is simply adorable! The lion is too cute! 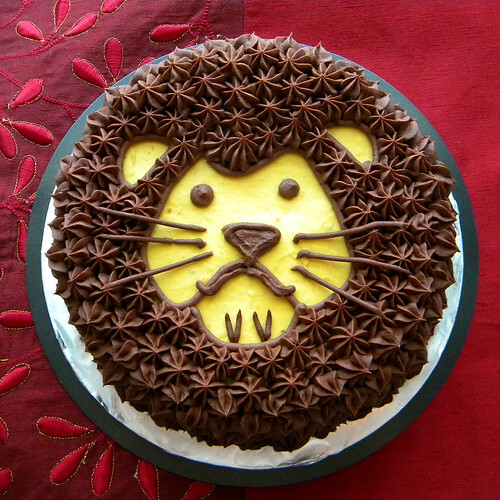 If only I had this cake for my first (or even twenty fourth) birthday party! Thanks for your nice comment :D! Anyway, if you need help with the translation, just let me know ;)!